Chants of “Rooo-seee-aahhh” rose from the largely Russian crowd. Vibrant flags and banners from 32 countries waved from every corner of the large building. Fans roared in anticipation of not just the game, but the full month of soccer delight ahead of them. Yes, this was none other than the opening match of the largest sporting event in modern history, the FIFA World Cup, between Russia and Saudi Arabia. Rewind to one week before this, to when the 2,500 participants in this year’s Gazprom Football for Friendship tournament landed in Russia on June 7, 2018. I joined a group of representatives from the United States that included Charlie Nobile from U.S. Soccer; Bennett Wehibe, a 12-year-old defender for the PA Classics; Bennett’s father; and my dad. Football for Friendship is an annual social program that takes place in rotating locations. 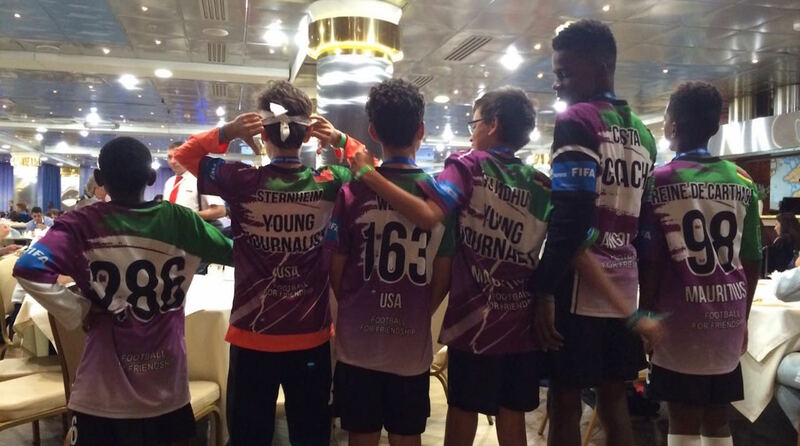 This year, kids and adults from 211 countries and regions participated as players, journalists, and coaches. Young reporters like myself were invited to cover the tournament and to write a daily newspaper about what was going on. Young coaches were brought in and each assigned to a team of 12-year-old players. After the participants were split into teams, they spent some time playing soccer and other games together to bond and make friendships. I was part of the Giant Panda team (each team name was based on an endangered species). Our teammates were from countries such as Angola, Mauritius, Portugal, Ukraine, Bulgaria, and Central African Republic. For the first three days, we spent our mornings at the Nine Values School learning about the nine values that the program was based on. In the afternoons, the teams would practice together for the games later in the week while we reporters attended lectures about journalism and wrote articles. The level of competitiveness was high, and each team was confident; things even got a little heated during scrimmages. On the other hand, teams did really seem to embrace the theme of the program throughout the week: Sports can bring together people from all over the world, no matter their race or skin color. Cultural barriers can be overcome through sports, including soccer. The 32 teams first clashed in an exciting group stage; then only eight teams remained. The Giant Panda team had mixed results, ultimately failing to make the knockout stages, but team members were proud of how far they got and their accomplishments. One of the exciting moments came late in the last game of the group stage. After the referee signaled a free kick deep in the opponent’s territory, Aleksandar Georgiev, a Giant Panda midfielder from Bulgaria, stepped up to take it. Everyone was watching as Aleksandar calmly rocketed a shot that flew past the wall of defenders, careening off of the far post and into the goal. Though the team was eliminated shortly after, the Giant Panda players gave their opponents a run for their money. After a break of a couple hours, the knockout stages began. 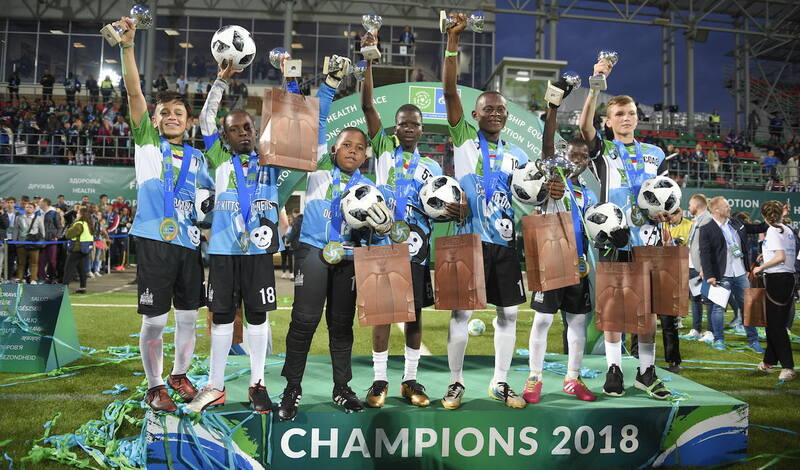 By that evening, the Chimpanzees, made up of players from Dominica, St. Kitts and Nevis, Malawi, Colombia, Benin, Congo DR, and a coach from Saransk were the champions. Although the tournament had ended so quickly, the best of the 2018 Football for Friendship program had yet to happen. The next day teams boarded buses to head for the Moskvarium in Moscow and the opening of the 2018 Football for Friendship Children’s Forum. Prizes were awarded to the best players and journalists from this year’s tournament. And then, the most exciting event: the opening match of the 2018 FIFA World Cup. The day after the Children’s Forum the participants were escorted to Luzhniki Stadium, where the opening match was about to proceed. After an exciting opening ceremony, the action began. Kids from hundreds of countries cheered together as Russia beat Saudi Arabia, 5–0, much to the delight of the Russian fans. The next day it was time to depart, but the participants in the program left Russia with new knowledge, friendships, and memories.